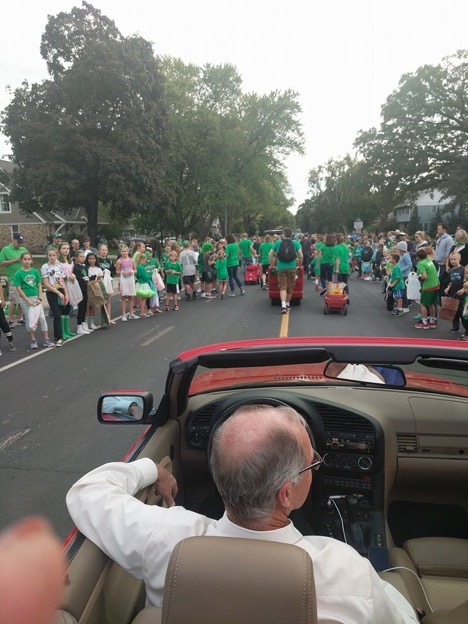 Sushmita's Journal, #3: Rotary Gala, Edina Day, and a Parade! I am so excited because today we are going to the Rotary Gala dinner and I am super excited to wear my Nepali dress. I went with my host mom and host dad. I was so happy to see to see my friends Paco and Sam too. We took pictures and we went for dinner. It was such a wonderful night and we had lot of fun. We listened lot of songs including Spanish songs. In cooking class we made waffles. It was fun to make and also it was same as we make back home. Today we had a new student in our English class. It was nice meeting her but it was hard to communicate because she only speaks Spanish. Today I was happy because we only have four class periods but each period is for 2 hours. In cooking class we made simple sweets scones. It was yummy and we had lot of fun making it. After school I went with Paula for immunizations. I was happy because I thought I will only get 1 or 2 injections but I was wrong, I got four and I just hate it. I also went to Savers with Paula to buy PJs and green clothes for Edina Day at school. Thank you so much! Today was called Edina Day and everybody wore green clothes. I wore the pants and the t-shirt that Paula bought for me. Today in school we had an event and we watched break dance, hip hop and others dances too. It was fun. I went there with my friends Selena and Baska. After school I was super excited to go to the homecoming parade. As Sam and I came out of the school there was a fancy red car and it was full of candies. I was so excited. We threw the candies from the car and it was so fun. We were sad because we didn’t have enough chocolates at the end of the parade but it was such a wonderful day. I can’t forget this day. THANK YOU VERY MUCH.